RON SWARNER: Favorites or underdogs, Czech or German, Saaz or Hallertau hops — it’s all the same in the Tournament of Beer: Northwest Pilsners. In the end, brewers from Washington and Oregon have one chance to brew the perfect pilsner, to ensure that fermentation conditions can be met and stay well within the temperature boundaries of the yeast. Screw up the diacetyl rest near the end of primary fermentation and brewers are watching from the sideline — drinking a pilsner, of course. 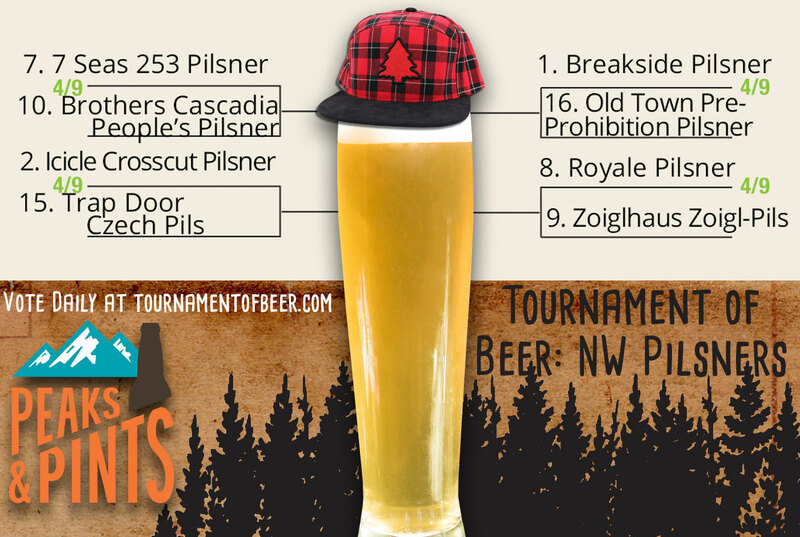 Sixty-four Northwest pilsners were selected and seeded by beer enthusiasts in February for the Tournament of Beer: Northwest Pilsners, which is now three days into the competition. Brackets don bulletin boards, break rooms, restaurant restrooms and birdcages. Office meetings have been moved to craft beer bars. Everyone is discussing wort aeration and lagering. It’s crazy fun. PEAKS AND PINTS WEATHER GUY: My forecast calls for showers early, then partly cloudy for the afternoon on the trail up to Hamilton Mountain at Beacon Rock State Park. Hi 56. Winds W at 5-10 mph. Chance of rain 60 percent. Chance I will repeatedly bring all conversation about wine tastings back to the spit buckets: 90 percent. RON SWARNER: OK. Below is a recap of yesterday’s action followed by eight new pilsners hitting the court today. PEAKS AND PINTS WEATHER GUY: P.T.P., Baby! Prime-time pilsners! RON SWARNER: The roar of the crowd last night in Wander Brewing’s taproom was deafening after Wander sales executive jumped up on the bar and began barking loudly. The whole room knew he was barking up the brewery’s Doglost Pilsner. What that Bellingham crowd didn’t know was Doglost was in a dead heat at 7 p.m. with Grains of Wrath’s Luger pilsner. While Peaks and Pints didn’t have a reporter inside Grains of Wrath’s taproom, we can guess everyone was head banging in unison to Led Zeppelin’s “Black Dog.” The two German pilsners traded leads most of the day, but Wander’s German Merkur and Hersbrucker hop combo proved too much during the last hour. Doglost grabbed 53 percent of the vote and wagged its tail into the Second Round. PEAKS AND PINTS WEATHER GUY: Bow wow wow yippee yo yippie yay! RON SWARNER: In an area of uncommon scenic beauty, Mount Vernon is adjacent to a vast river delta that stretches west to the Puget Sound but is otherwise surrounded by mountains. According to the census, 33,787 people live between the river delta and the mountains, compared to 2,116 inhabiting the backwoods of Carson, Washington. Maybe it’s a number games, or maybe Farmstrong Brewing’s use of Skagit Valley Malting’s grains ignited the whole valley between Bellingham and Arlington. What we do know is Cold Beer Skagit Pilsner chopped down Backwoods Brewing‘s Gifford Pinchot Pilsner with 71 percent of the votes for a date with Wander Doglost Pilsner in the Second Round April 18. 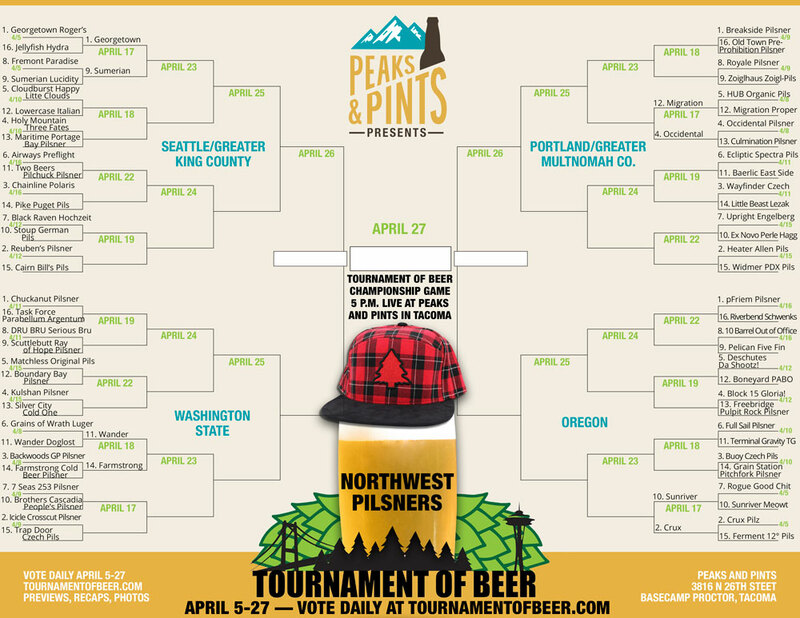 PEAKS AND PINTS WEATHER GUY: Finally, the farmers actually beat the lumberjacks. RON SWARNER: I feel bad for the cyclists on this one. But, something tells me they’ll survive, and they’ll do so holding a delicious Organic HUB Pilsner. Unfortunately for bicycle-themed Hopworks Urban Brewery the task of taking down the Migration Proper Pilsner was simply too much — and the votes told the story. When all was said and done, Migration moves on with 58 percent of the vote. PEAKS AND PINTS WEATHER GUY: Looks like the card is in the other spoke now. RON SWARNER: Occidental Brewing’s Bohemian-Style Pilsner pours clear golden with vertical rows of rising bubbles. It hits the nose with subtle bread and a touch floral. The initial taste is bready malts, with a level of hop flavor and bittering in the middle and finish — not the typical American craft over-hopping, but just about right for a Czech pilsner. It’s a favorable flavor profile, at least according to the vote totals in the Tournament of Beer. Occidental put the hurt on Culmination’s Czech Pilsner with 84 percent of the votes. Number 4 seed Occidental Bohemian-Style Pilsner moves into the Second Round. PEAKS AND PINTS WEATHER GUY: No hocus pocus, just focus in Portland’s St. Johns neighborhood yesterday. PEAKS AND PINTS WEATHER GUY: OK, let’s do a quick liver-size check, then dive into today’s First Round pilsner battles. Vote for one pilsner per game. Voting for today’s pilsner battles ends at 11:45 p.m.
RON SWARNER: Hey, that’s my line! 7 Seas bartender Rachyl holds her precious 253 Pilsner. 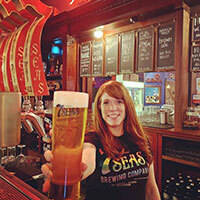 RON SWARNER: 7 Seas Brewing and 253Heart joined together to craft a beer that supports the Pierce County community by donating a portion of the 253 Pilsner proceeds to a variety of local non-profit organizations. Two organizations are selected at any one time to receive a portion of the sales, up to $5,000. After the goal is hit the two organizations continue to select small, local, state certified 501C-3 and 501C-6 non-profits. The goal is to find the local non-profit organizations that this money would make a large impact to. 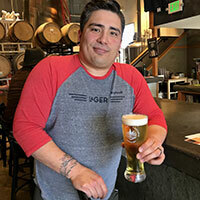 In regards to the 253 Pilsner taste, 7 Seas co-owner and head brewer Travis Guterson brewed more than five test batches, with different hops and different malts, to dial-in the recipe. “Travis settled on Sterling and Cascade hops,” says his business partner, Mike Runion. “It’s a Northwest interpretation of a pilsner.” Guterson and Runion brewed the 253 Pilsner with Northwest Pale and Pilsner malt, hopped with said hops, for a 100 percent Washington, refreshing, dry and crisp premium pilsner. PEAKS AND PINTS WEATHER GUY: Hey! Did you notice 7 Seas was nominated in as a number seven seed? Neat! Brothers Cascadia Head Brewer Jason Bos presents his The People’s Pilsner. RON SWARNER: Sherman Gore, head brewer Jason Bos and Richard Tiffany helm Brothers Cascadia. Gore and Bos previously worked together at Laurelwood Brewing. The Hazel Dell, Washington brewery specializes in classic and experimental IPAs and clean lagers, such as their The People’s Pilsner. This Czech pilsner showcases the malt, not hops, leaving the finished beer with a slightly sweet, toasted, biscuity, bready aroma and ﬂavor. The superstar ingredient being Weyermann Floor Malted Bohemian Pilsner malt, where the germination stage takes place on a floor made of tiles quarried only in the Bavarian village of Solnhofen. At the proper germination stage the malt is sent to the kiln to dry at a much slower pace than modern practices almost doubling in duration and leaving the malt with a rich aromatic flavor superior to modern industrial practices. PEAKS AND PINTS WEATHER GUY: My bedroom floor germinates bunches of dead bugs mostly, and nuts and bird feathers. National Geographic pictures of cities around the world covers a quarter of the space. Icicle Brewing bartender Joe offers up a pint of his Crosscut Pilsner. RON SWARNER: Icicle Brewing Co. sits in the Bavarian theme park known as the city of Leavenworth, which seems perhaps the most appropriate place for a brewery. Owner Oliver Brulotte, who has deep family roots in Washington’s hop farming history, basically launch the Wenatchee Valley’s craft-beer boom. The brewery draws their water from nearby Icicle Creek, a run-off from surrounded by numerous mountain ranges including the Stuart Range and Wenatchee Mountains. Icicle Brewing head brewer Dean Priebe brewed this multiple award-winning pilsner-style lager with a floral bready maltiness in the background providing balance to herbal and light spicy hoppiness that finishes cleans with a little pop of bitterness on the finish. PEAKS AND PINTS WEATHER GUY: If Icicle Brewing is all about strong-armed frauleins attending to masses of thirsty, folk singing revelers, then sign me up! RON SWARNER: The father/son tandem of Bryan Shull and head brewer Zane Singleton opened Trap Door Brewing in fall 2015 with a 15-barrel facility in the Uptown neighborhood of Vancouver, across from the city’s busiest dispensary, and right next door to a food-cart pod. 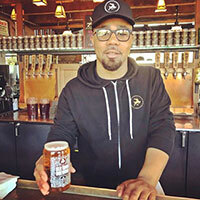 Singleton grew up in Northern California and went to school for fermentation sciences at UC-Davis. His take on the traditional Czech-style pilsner comes with a bunch of Hull Melon hops. This “flavorhop” has a strong fruity character making Trap Door’s Czech Pils refined, delicate, flavorful and thirst quenching. 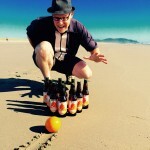 PEAKS AND PINTS WEATHER GUY: Watch out! It’s a Trap! 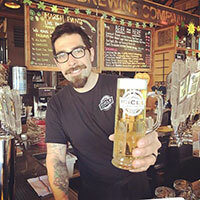 RON SWARNER: In 2010 — with his Siebel Institute education, training in Germany and Belgium, and degree from Yale tucked under his arm — Ben Edmunds opened Breakside Brewery in the quiet Woodlawn neighborhood of Northeast Portland as a restaurant and nano-sized brewery. Breakside expanded to a 3.5-barrel brewhouse while winning their first medal at the Great American Beer Festival in 2011 where they have earned medals each year since. 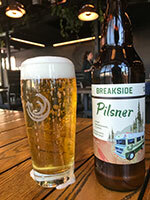 Breakside’s Pilsner hits the nose with bready, grainy pale malt, white soup crackers, subtle apple and pear fruit notes, slightly edgy yeast, and peppy leafy, herbal, and rather floral hop bitters. Yet, it glides in with grainy malt flavors that build a solid, biscuit foundation, on which is perfectly balanced a classically floral German hop profile. It’s not a loud mouth. It’s not trying to steal your girlfriend. It’s just a very well balanced German-style pilsner — a clean, thirst-quenching lager. PEAKS AND PINTS WEATHER GUY: If I were a pilsner, I would be Breakside’s Pilsner because I’m definitely not stealing anyone’s girlfriend. Old Town Brewing bartender Tony offers up his Pilsner. RON SWARNER: As a child Adam Milne loved Old Town Pizza in Portland. He loved the garlicky, pizzeria-style pies. He adored the ghosts that haunted it. In 2003, he purchased the downtown pizzeria from the Accuardi family. In 2008, Milne built a second location in the Northeast district of Portland, in his very own King neighborhood, which would soon become a massive Valhalla-esque brewpub, Old Town Brewing. Since then, Milne has slowly but steadily started churning out award-winning beers under the guidance of former Sam Adams R&D brewer, Andrew Lamont. Old Town’s Pilsner: Pre-Prohibition Lager is packed full of delicate German Nobel hop aroma and flavor with balance, and lingering notes of fresh flowers and honeyed biscuits. PEAKS AND PINTS WEATHER GUY: I’ve never had much trouble frightening people. 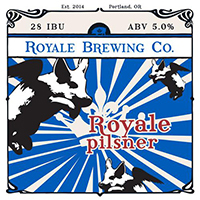 RON SWARNER: Mike Weksler, Jack Houston and Paul Bastian had been pushing through Alameda Brewhouse’s exit doors with kegs of their Royale Brewing Co. Pilsner and Fat Unicorn Pale until they found their own brewhouse down the street in Northeast Portland, followed by their own taproom in the city’s St. John’s neighborhood. Their journey hasn’t been easy. In fact, the brewery has been reported for sale, which is sad since they brew delicious beer, including their hoppy pilsner nominated in this tournament. Good luck to this Bohemian-style pilsner with a strong noble hop nose and light citrus, and good luck to the Royale folks. PEAKS AND PINTS WEATHER GUY: I remember the night Mike Weksler hung out at Peaks and Pints. Cool dude. RON SWARNER: Alan Taylor learned to brew beer while earning a PhD in language. Beer spoke his language. He went to VLB in Berlin and then spent more than a decade bouncing back and forth between Germany and the US as a brewer. When he opened Zoiglhaus in 2016, it wasn’t a shock that he would produce classic German beers (and a few American ones, as well). In Berlin, he studied the obscure Berliner weisse style and makes one of the best examples in the world, and in 2017 his pilsner won gold at GABF. Yes, it’s a shock his Northern Germany was only seeded at No. 9. Brewed according to the German Purity Law of 1516, it’s dry, crisp with spicy and snappy hop flavor and aroma. PEAKS AND PINTS WEATHER GUY: Zoigl is a fun word to say. Zoigl.